Lights illuminate the facade of the Freising Rathaus (the town hall) and the Bell Tower of St. George's Church at dusk, located in the Marienplatz, in the town of Freising, Bavaria, Germany. 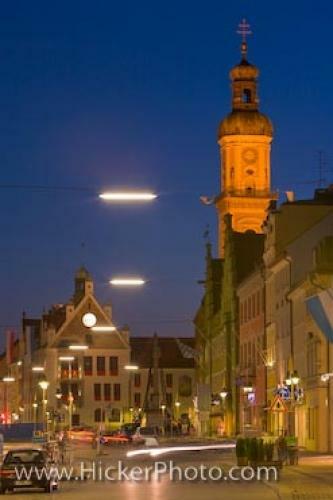 The lights in the Bavarian town of Freising, light up the decorative facade of the Town Hall (Freising Rathaus) and the Bell Tower of St. George's Church in the Marienplatz, which is a famous square right in the centre of the town. It has existed since 1158 and used to play host to markets and tournaments in the Middle Ages. Now it is the location of many attractions in the town and also numerous shops and restaurants. St. George's Church, which the Bell Tower sits on, has stood on that spot since 1440, and it is actually not known who built the church. It is built in the traditional Gothic style of the time, but it has never been discovered who designed the impressive building. The Bell Tower itself was not built until 1689 by Antonio Riva, who was a native of Graubünden, Switzerland. Tower of St. George's Church at dusk in Freising, Germany. ... has numerous historic buildings and famous works of art, and the architecture of the town is so impressive in itself, as can be seen from the Rathaus and the Bell Tower in the photograph. The buildings stand now as they did centuries ago, affording the visitor a look back in time - practically undisturbed. Facade of the Freising Rathaus (Town Hall) and bell tower of St George's Church in the Marienplatz seen from along Untere Hauptstrasse at dusk, City of Freising, Bavaria, Germany, Europe. I photographed this photo with the digital SLR camera model Canon EOS-1Ds Mark III, aperture of f/10.0, exposure time of 32/10 sec. on ISO 100, as always I used a original Canon Lens, the focus lenght for this picture was 100mm.